A BEAUTIFUL celebration of friends and family surrounded Dudley Roylance to celebrate his 94th birthday on January 25. Mr Roylance, who is described as "salt of the earth", commemorated the event at the BITS club in Boyne Island. Daughter Loraine Howkens said her father was both hardworking and widely treasured. "He is a very loving and outgoing man," she said. "Very family-orientated, he just loves talking to people and makes friends with just about everyone he meets." Guests travelled from Miriam Vale, Monto, Brisbane and Biloela to honour a man they all think the world of. 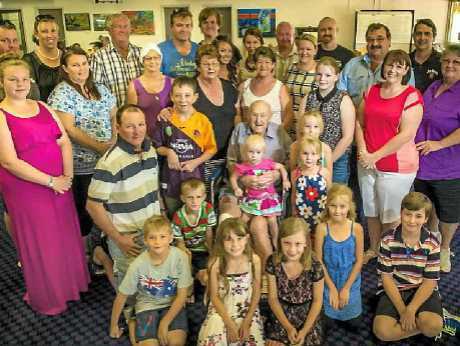 A former dairy farmer and lifetime Central Queensland resident, Mr Roylance revelled in the occasion to share the day with four generations. Do you have a special occasion that you want to share with your community? Whether you're celebrating a birthday, anniversary, wedding, birth, engagement or remembering the life of a passed loved one, The Observer wants to hear from you. Send your milestones and obituary notices to ebony.battersby@gladstoneobserver. com.au or phone Ebony on 4970 3040.